SMI is the world’s most comprehensive specialty components fabricator, and a leading provider of knife cutting services for a wide range of industries and applications. Our diversified technologies have allowed us to stay on the cutting edge of gasket & seal manufacturing. Knife cutting offers the flexibility to cut virtually anything you would cut with a utility knife – but with the speed and precision of a CNC router. From high-temp ceramics to leather, fabrics, and an unlimited variety of foam and sponge, knife cutting provides speed and precision for highly specialized industries such as aerospace, and automotive. SMI’s digital knife cutting equipment delivers both high cutting speeds and craftsman-level precision you can count on every time. 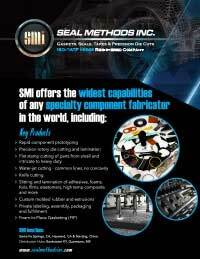 SMI proudly maintains a modern manufacturing facility with the most advanced knife cutting machinery available today. Ideal for short run, fast-turn work, our systems are well suited to full-scale production as well as prototyping. At SMI, our sales engineers guide clients through the specification process, to find the most appropriate tools and materials – both performance-wise and price-wise – for your application. Our in-house capabilities mean our experts can specify, design, and manufacture everything on site, so our clients know they’re getting the right material for the functionality, as well as cost savings and exceptional quality control. Request a quote online, or call 800-423-4777 to learn what our knife cutting capabilities can help you achieve.